Awesome news for Ultra/RESISTANCE fans!! Having already taken over Ibiza earlier this summer, RESISTANCE, Ultra Worldwide’s ever-growing house and techno arm, announces monumental plans for this fall/autumn. 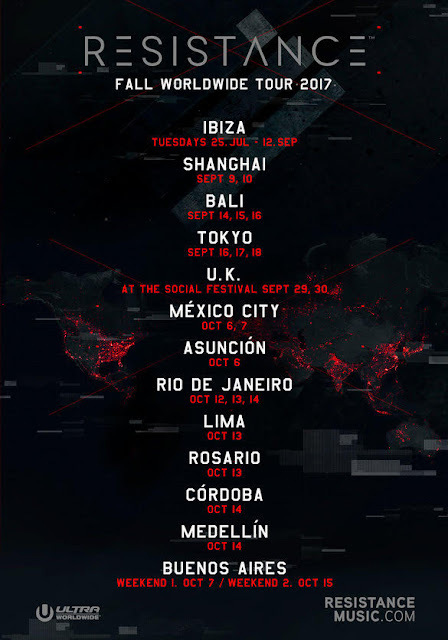 Eleven different countries will host RESISTANCE over the coming 60 days, with events set to run in Shanghai, Medellín, Mexico City, Rosario, Córdoba and the United Kingdom for the very first time, while Tokyo, Buenos Aires, Bali, Rio de Janeiro, Asunción and Lima all prepare to welcome back the behemoth concept with some countries even preparing to host multiple shows. Just some of the names set to perform at the upcoming events include Adam Beyer, Carl Cox, Dubfire, Jamie Jones, Joseph Capriati, Nic Fanciulli, Nicole Moudaber, The Martinez Brothers, Paco Osuna, Richie Hawtin, Sasha | John Digweed, Seth Troxler, and Stephan Bodzin with many more still to be announced. RESISTANCE will debut in Shanghai on September 9-10 at ULTRA China, before heading south along the South China Sea, to become a part of the newly formed Bali Music Week that will take place on September 14-16. Check out the full dates below and line-up so far.